Horizontal Chain &amp; Rope Testing Machines For Testing Lab for Tensile Testing Lab. Horizontal Chain & Rope Testing Machines - It has a high loading accuracy, infinitely variable straining speeds to suit a wide range of material. It has a continuous roll auto graphic recorder to get load - elongation graph, robust loading frame, simple controls and easy to operate. It has a adequate safety device for safe operation and embedded analogue models with large dial and load measurement by pendulum dynamo meter principle. It has been embedded with special accessories like extra bed length, extra ram stroke, various special grips , attachments, fixtures as per sizes or shapes of specimens, load-stabilizer though at an extra cost. There are various models available with maximum capacity from 100 kN to 3000 kN. Its loading accuracy is within ±1% and conforms as per international standards. for Tensile Testing - Horizontal Chain & Rope Testing Machines - specially fabricated for testing chains, ropes & any long specimens for proof test or destructive tensile test. These machines are available in digital or computerized models apart from the standard ones. In these, load Vs elongation is in digital display and printout of results can be taken easily. We are leading manufacturers, suppliers & exporters of Horizontal Chain & Rope Testing Machines For Testing Lab for Tensile Testing Lab. Contact us to get high quality designed Horizontal Chain & Rope Testing Machines For Testing Lab for Tensile Testing Lab for schools, colleges, universities, research labs, laboratories and various industries. We accept bulk orders for government tenders in all countries around the globe. 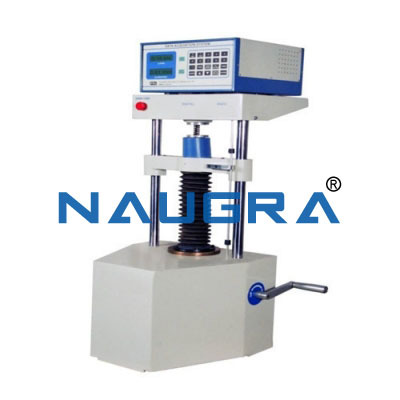 For similar products visit at main page of Tensile Testing Machines.